located in upper state New York. what ever branch of tree you are up in. pure fun – for most of us. where people are on vacation. the usually forget their common sense. while we work so hard only to find release when we have time off. without having to punch a clock. only to discover that people have bottles stashed in their tents). in high fashion and full color. as a pathway to the restroom. and glared at the first attempted trudging through our encampment. This did not go un-noticed. and a scowl that would send most smart people running. due to a hast trip to the lue. ready to give you a clue! I felt that it was not enough. I also created the Clue Coin. (sometimes referred to as the “Dude Coin”). it is well worth carrying. but indeed they are wrong! Present them with the coin to prove it! fortune is already smiling on you! the stories of the clue fairy have become legendary. 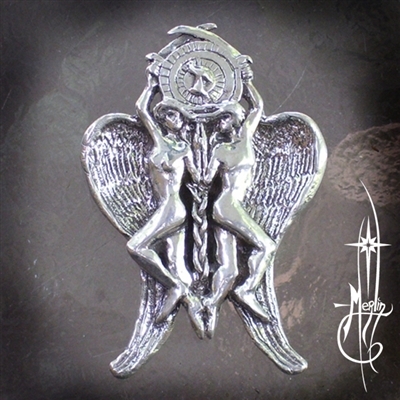 Amulets by Merlin celebrates 35 years! This weekend I am celebrating my 30th year! The story of the beginning of Amulets by Merlin actually takes place over a decade earlier. 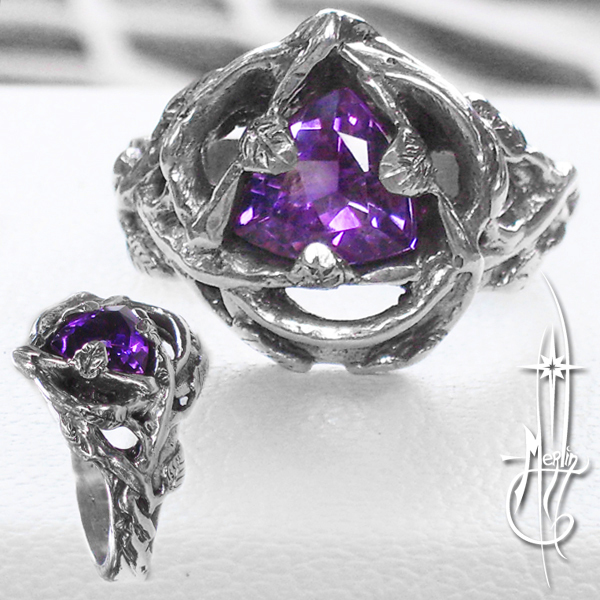 I have been interested in the making of jewelry and sculpture for most of my life. In the early days of High school (1971 I was in a Madrigal group, singing A cappella with a small host of other students. I wanted to make something for the girls to go with their formal gowns. For a few years before I have been beading and creating beads and charms for my own amusement as well as sculpting in clay. For the Madrigal group I decided to forge ahead and fuse bent wire in the shape of the word: “Mads” to be hung on chains. The girls loved them and thus I began a journey in discovering their fabrication end of jewelry making. As life does for so many of us, I found myself getting married and taking on jobs such as construction and later working as a draftsman, truck driver and other forms of employment. I continued to focus on the arts in sculpture and painting, but still attempted to make rings, and necklaces. 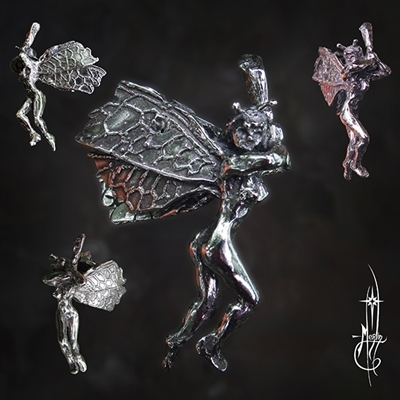 In 1985 I refocused my efforts to to transform images of the Tarot into small sculptures. Because of this fascination I attended (a year later) an exhibition of La Lioue jewelry. I was inspired and in mid April of 1986, I took out my first business license and began to form my own line of jewelry. I then began my public presence in a shop called “The Crystal Cave” in Costa Mesa, California with the blessings of Karen Tate. Slowly I built up my tools and shop. After a severe accident, I found myself no longer able to drive a truck and so focused on jewelry design full time in 1990, the next year I received training at the Gemological Institute in California. My first big festival was Marshal Scotties Renaissance Fair in Southern California. After several festivals on the west coast I moved to Virginia. By 1992 I completed the jewelry line for the Tarot, also developed a lot more featuring God and Goddess images, natural themes such as trees and flowers. I had also taken on a number of custom pieces. By the time the digital age came into being, better photographs were available to me and by 1998 I started my first online presence, all the while attending art festivals, gatherings and other events up and down the East coast. After decades of being on the road, I have now focused more on custom designs and staying in my shop as much as possible. You may still view my work at the Mystic Moon in Norfolk Virginia or on line at Amuletsbymerlin.com. It has been a very long and strange road, indeed. In a couple of weeks I plan to release a new piece! Watch for it, it’s a big one! A bee rests on a musical notation: the Flat. This carving of a bee poised on the flat sign may be worn as a pendant: the jump ring is hung from her antennae. The Flat Symbol is used in musical notation to indicate the note being played is to “go down” (in tone) one half step. In a key signature, a single B Flat is the key of “F” or “D” minor. I have a hive in my yard and have been fascinated by the Bees tending our gardens over the past couple of years. 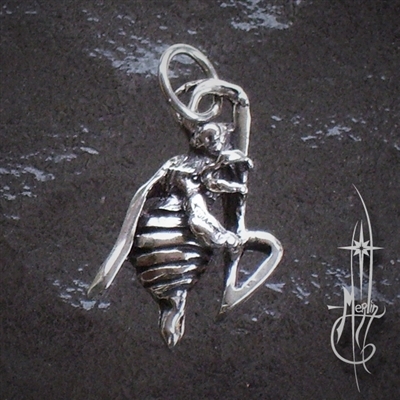 This is my First “Bee Jewelry” offering. 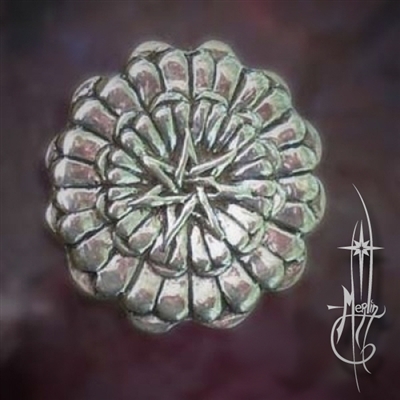 One inch tall, available in Silver or Bronze. This musical amulet was originally designed as a gift I created for my piano students and the dear ones in my family for Yule. After waiting a few months I have decided to offer this piece as a part of my musical line of jewelry. More musical notation jewelry may be found on my Music Jewelry Page. 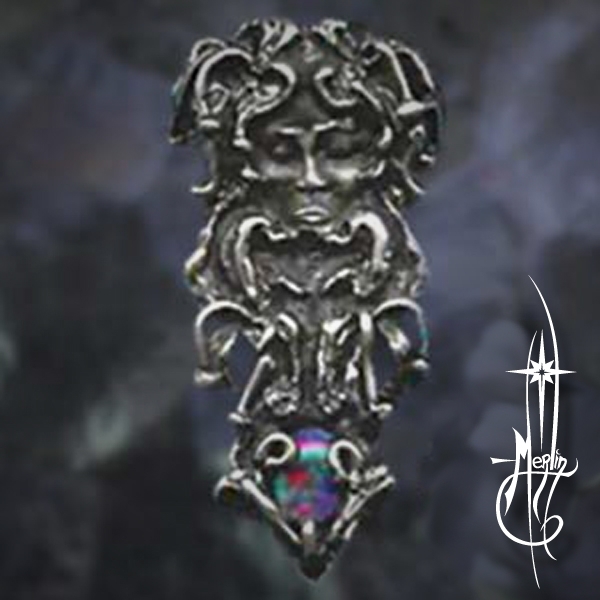 You may recall I have been making Isaac Bonewits designs in my jewelry line for some time. 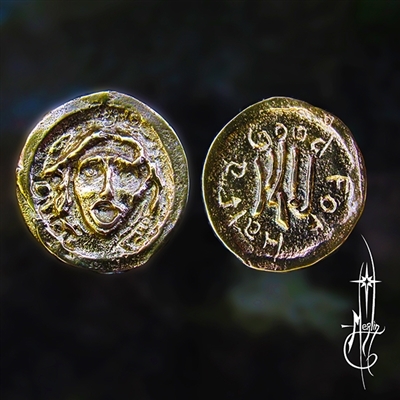 I have recently developed his classic Druid Awen as a Brooch. The Awen Isaac created is more than the simple dot and stave seen in the old writings: this is a wreath of oak leaves with the Mesopagan Druid symbol of the “three rays of light” emanating from three acorns and staves (like wood) completing the design. 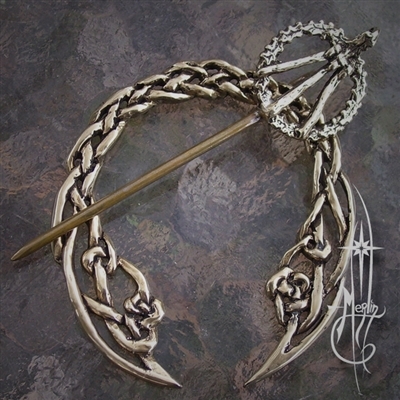 I have augmented the piece by making it a functional Penannular Brooch. the Brooch Frame is of knot work of my own making with a pin mounted and able to “travel” around the frame. To learn how to use a Penannular Brooch and learn more about this new piece, please visit my page The Awen Penannular Brooch. To see more of my designs of Isaac Bonewits, please view my Bonewits Collection. Shortly after I founded Amulets by Merlin in the 1980s, I was commissioned with a project: to develop a piece combining the two basic images used in the Sun and Star cards of Aleister Crowley’s Thoth Tarot Deck. In the Sun card the main focus is the Sunflower: a common symbol harnessed in many other Tarot Decks, but this one was special: twelve segments, each divided into two aspects. This represents the houses of the Zodiac divided into their active and passive principals. In Crowley’s deck he also used the seven pointed star to symbolize the the Star Card: associated with Tazaddi (a Hebrew letter) often considered in Qabalah as “the fish Hook”, meaning the process of meditation is akin to lowering a “mental fish hook” plunged into the depths of the Great Unconsciousness (Akesha). Combining the aspects of these two ideas produces the simultaneous process of seeing all of creation in all of it’s glory and yet being “passive” enough to understand it’s subtleties.